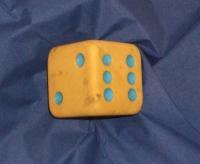 A standard die has the numbers 1, 2 and 3 are opposite 6, 5 and 4 respectively so that opposite faces add to 7? If you make standard dice by writing 1, 2, 3, 4, 5, 6 on blank cubes you will find there are 2 and only 2 different standard dice. Can you prove this ? 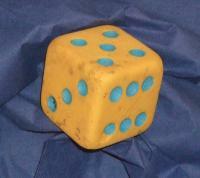 The numbers on the dice talked about in this problem are arranged in the traditional manner where the sum of the numbers on opposite faces is always seven. Jenny and her family often roll a die to decide who gets to eat the last slice of pie. There are three people in the family so it's easy to ensure it's fair: each person is allocated two of the six numbers. However, when they roll it, the die always seems to land "edge-up" on a napkin, and they have to roll again. One day, Jenny suggests that instead of rolling again, they simply add the two faces that meet at the top edge. What different scores could Jenny and her family get? Before they throw, everyone chooses some of the scores so that if one of their numbers comes up, they get the last slice of pie. Can the scores be allocated fairly? What if there are more, or fewer, people at dinner? How could the scores be allocated fairly this time? This problem is based on an idea shared by Paul Stephenson. Working systematically. Squares. Dice. Generalising. Cubes & cuboids. Visualising. Symmetry. Mathematical reasoning & proof. Games. Interactivities.